Back in Sept. 2012, when I started Le Pharmachien (the original French version of The Pharmafist), my first post ever was a sarcastic video about homeopathy, and about how absurd it is that we sell these products. Since then, not much has changed. We still use the same fake arguments to justify ourselves. What difference does it make if it’s popular or not? Healthcare and science are not popularity contests. 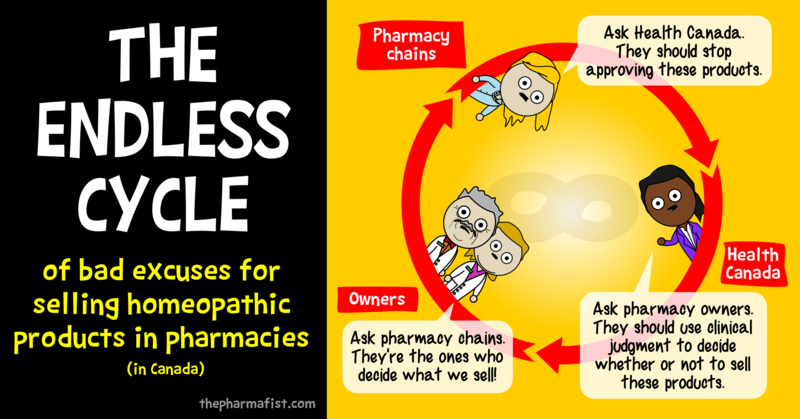 If people want to buy homeopathy, fine. But our role as pharmacists is to provide advice and care based on scientific evidence. When homeopathic products are sold in pharmacies, it gives the false impression that we endorse them. Interestingly, most pharmacists don’t trust homeopathic products at all… but are stuck with them on the shelves. It’s a problem. Not true. If people neglect to seek medical care because they trust homeopathy, it’s extremely hazardous. ALL healthcare interventions generate a placebo effect: medications, surgeries, exams, talking to patients… These interventions are supported by scientific evidence, and have a placebo effect as a BONUS. Meanwhile, homeopathic products are 100% placebo, but pretend otherwise on their labeling and are sold at ridiculously high price tags. How is that acceptable? Also, by opposition to what most people think, from a pharmacy owner’s perspective, it’s not “money-related”; margins are low and associated profits are negligible (in my experience, 80-90% of profits in a typical pharmacy come from prescription drugs). Who’s making money, then? Manufacturers. Will someone ever take responsibility for the problem? Let’s be clear: Health Canada will not stop approving these products. Some countries have set limits, but none has officially banned them. So we have to stop waiting for them to make a move. In my opinion, the simplest solution is that a pharmacy chain takes a stand and announces that it will no longer sell homeopathic products. With a bit of luck, others will eventually follow. So, who will be first? P.S. Oh by the way, I’d like to salute the Quebec Order of Pharmacists, who stated, in response to the McGill investigation, that a pharmacist who recommends homeopathy by claiming that it is effective would “place oneself in a situation of disciplinary misconduct”. BOOM!